James Arey, Ph.D., LPC. Jim retired from the New Orleans Police Department in 2009. He spent 20 years as Commander of their SWAT Crisis Negotiation Team. Retirement lasted one week. He is now a full time Staff Instructor at the Jefferson Parish Sheriffs' Office Academy and team member of their SWAT Crisis Response Team. Jim is a US Army Veteran having served in the Republic of Vietnam 1967-1968. Jim is an adjunct professor at the Loyola University in New Orleans where he teaches Forensic Pathology and Crisis Intervention. Lt. Mark Lowther (Ret.) is a US Marine Corps veteran. Lt. Lowther retired after 24 years of service with the Weber County Sheriff's Office (Ogden, Utah). His background is varied and diverse. He has served as a SWAT hostage negotiator for over half of his career. His background and experience comes from serving on two Metro SWAT teams. Lt. Lowther has experience on all levels of negotiations from tech to negotiation team leader. He has personally been involved in numerous threatened suicide and SWAT negotiation incidents. Lt. Lowther was also a primary negotiator during one of the first known hostage negotiations involving social media. Lt. Lowther is a member of the Utah Tactical Officers Association, National Tactical Officers Association, and a lifetime member of the International Association of Hostage Negotiators. Lt. Lowther had an article on crisis negotiation published in NTOA's The Tactical Edge and Crisis Negotiator publications. Lt. Lowther has an extensive background and training in suicide intervention and mental illness. He has instructed law enforcement locally and nationally on law enforcement interaction with suicidal individuals and the mentally ill. He was named by the Utah Tactical Officers Association as the 2012 Crisis Negotiator of the year. Jack Cambria is a recently retired member of the New York City Police Department who has contributed 33 ½ years of exemplary service. He has served for 16 years in the Emergency Service Unit (ESU), whose primary focus is to provide Rescue, Tactical (SWAT), and Counter-Terrorism services to the City of New York. He was assigned to ESU in the ranks of Police Officer, Sergeant and Lieutenant. He has extensive experience and certifications in all facets of these operations, and is a New York State Certified Police Instructor. He holds numerous awards for bravery and dedicated service. He has responded to and served on many high profile assignments such as both World Trade Center disasters, plane crashes, and a variety of hostage and barricade situations, particularly violent and suicidal individuals. He also served as the Rescue Team Manager on the FEMA-Urban Search and Rescue Task Force. Because of his solid foundation of achievements, Jack was assigned to command the agencies elite Hostage Negotiation Team for the last fourteen-years of his career. His duties consisted of coordinating the efforts of over 100 negotiators, who responded throughout New York City to all hostage related assignments. 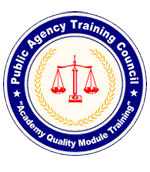 He was responsible for the training and certification of all new negotiators and refresher training of all of the current members of the team. Jack has and continues conducting in-service training for many international, federal, state and local law enforcement and corporate agencies. In 2006, he and two selected members of his team were dispatched to the U.S. Military Base at Guantanamo Bay, Cuba to conduct hostage negotiation training for members of the United States Joint Task Force. He has also served as a technical consultant in the entertainment industry, where he advised on the major motion pictures, ‘The Taking of Pelham 1-2-3,’ ‘Jack Ryan: Shadow Recruit,’ and ‘The Amazing Spiderman II;’ additionally for the television series, ‘Life on Mars,’ ‘Blue Bloods,’ ‘Unforgettable,’ ‘Elementary,’ and ‘The Mysteries of Laura.’ Jack has authored several scholarly articles on negotiations and has achieved his Masters Degree in Criminal Justice. He has served as an adjunct professor at the John Jay College of Criminal Justice (CUNY) and the Empire State College (SUNY) in New York City. 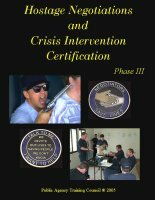 Hostage Negotiations Phase III training module is a continuation of Phase I and Phase II that builds on the solid foundation of theories and practicum of Hostage Negotiations. Dealing with victims of P.T.S. D.
NOTE: To qualify to take Phase III Hostage Negotiations Certification you must have completed Phase I & II Hostage Negotiations through Public Agency Training Council. No other hostage training courses will qualify an individual / team qualify to take Phase III.